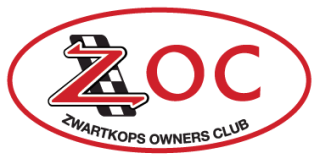 The Zwartkops Owners Club (ZOC) is for all Motorsport enthusiasts who want to become part of Zwartkops. Membership is open to anyone, from competitors to spectators. Use of the facility at the “TOP OF THE HILL” for yourself and a guest, with secure parking for one vehicle, canteen, bar facilities and grandstands. EXCEPT for the International Race Meetings, members get ONE FREE ticket per member to access through the main gate entrance for all Zwartkops organised events. If we all make Zwartkops successful we will have a 10% stake in Zwartkops once all outstanding debt has been repaid to the vendor (Peter du Toit). Membership is limited to 500. Once this level is reached no more memberships will be sold. Anybody wanting to become a member will then have to buy membership from an existing member. Members qualify for a reduction on their own race entry fee (as a competitor) of R100 as well as Trax Days, Bike Brunch Days and Zwartkops Practice Days. Your valid ZOC membership card must be presented to qualify for the discounts. If not, you are liable to pay the full fee & no discount will be refunded. ZOC membership is not transferable.